Golf, with an emphasis on precision, and players always initiating rather than reacting to the action, is a natural for the mobile platform. That doesn't mean any offering - even one with the weight of Tiger Woods and EA Sports' names behind it - is automatically on the green in two. 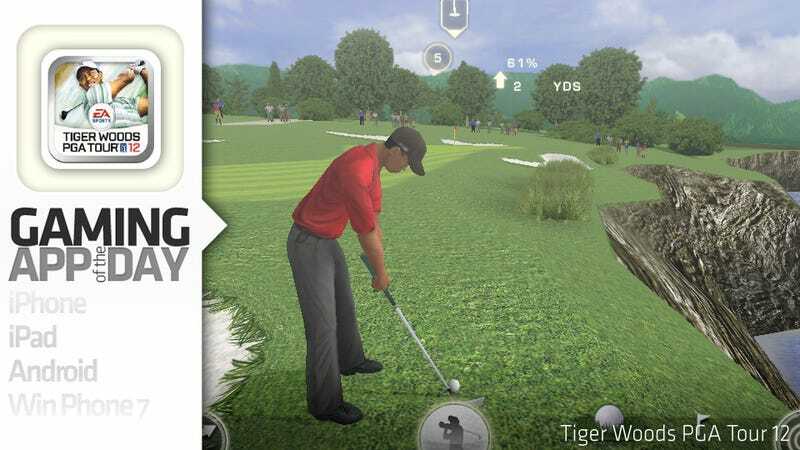 Following up last year's successful debut on iOS devices, Tiger Woods PGA Tour 12 tinkers in the right areas, sensibly leaves others alone, and does plenty enough right to remain the top title in a crowded field populated mostly by arcade entries. It is a hefty buy, though, $6.99 on the iPhone and iPod Touch, $9.99 on the iPad. First off, while its console sibling is getting a lot of press for featuring Augusta National and The Masters Tournament, neither are included here (otherwise, they'd probably be in the title). You still do get seven real-world courses and one fantasy links ("The Predator," which also appears in the console game). In addition to the touch controls, the iPhone game varies from its console sibling in several aspects of gameplay, notably the near-mandatory use of shot boost and also mid-flight ball-spin. While these are arcade-style elements, they're sensibly implemented and keep the game focused on action. Another variant Tiger Woods PGA Tour presents on the mobile devices is considering the percentage of distance you're likely to get from your lie. This is a common device of golf games, one used to make playable hazards more dangerous and shots approaching them riskier. In rough or sand, you'll be faced with, say, a maximum of 64 percent shot power coming out. If your objective is a 90 percent power shot, adjust your expectations accordingly. The career mode is appreciated but a bit slapped together. The biggest barrier is how underweight your golfer will be first starting out. I can understand not having the shot power to reach the green of a par 5 in two. But not even reaching the fairway with my drive on TPC Sawgrass' No. 2 was a bit too much to swallow. Fortunately, you'll have plenty of opportunities to acquire XP (represented as cash) to rank up your golfer. Unfortunately, that's because there's no way to shorten the event structure to fewer than four rounds. With four events each month - and no means to skip them - you're in for a hell of a lot of grind. And with eight courses, you'll hit a lot of the same stops repeatedly. There are multiplayer features within the game but they depend greatly on others. Online multiplayer is a great inclusion, in concept, provided you can link up with someone playing the game at the same time. A Facebook daily closest-to-the-pin challenge is endlessly replayable but the point of it all - beating a friend's mark - depends on Facebook friends both owning and playing the game. Visually, it's still tough to center my expectations of this device. What we've got is between two and one console generations ago. Player models look very good, but some course features are pretty generic and the ball seems to lack much interaction with the surfaces beyond slowing down or rolling hard off the green. That said, the courses are playable visually, in that lining up your shot based on what you see delivers a true result. I wish the career mode were a little more adaptable, as golf is a video game sport that is most often played with your avatar, rather than a licensed pro. The roster you get in Tiger Woods PGA Tour 12, and the solid course variety combine to deliver a lot of shot creativity and deeply satisfying long hits and putts. It has just enough arcade quality to be a fun play, but its other features, notably the price, let you know it's a game for those serious about golf.